I have been fishing for the last 50 years. My father started me off fishing every weekend since I was 5 years old fishing for Bass on the Potomac. 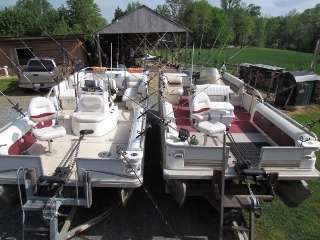 In the 80's I got into BASS Tournaments and fished on average 20 to 25 tournaments a year till I moved to Lake Anna in 1989 to build and operate a marina down lake [Pleasants Landing] with my wife. Living on the water we fished together a lot for Bass until one day she hooked a 15 pound Striper on a jerkbait and that's when I got hooked on Striper Fishing. I was always addicted to fishing but the thrill of locating and fighting Stripers made me go crazy! After meeting and fishing with some friends who also were addicted [Anthony Hicks "Striperholic", Danny Ratcliff "Baitrunner" and Gene Hord "a guide who knew every Striper by name back then"], I knew guiding for stripers would be my destiny. I fished with artificial lures for 6 or 8 years until I realized what Gizzard Shad and Herring would do to a Striper. Now I always have a tank of bait on board along with my favorite lures. I guided as an associate guide for another service on the lake for a couple of years before starting Lake Anna Striper Guide Service. Throughout the years my customer base has grown to the point that I had to bring on additional guides. I team up on the water with my other guides to locate the schools of Stripers for our clients. I am the only guide on the lake who fishes for Stripers full time. My clients catch more Stripers than all other Guides clients... COMBINED. My Fishing Techniques: When the fish are shallow I will pull 10 to 12 planner boards rigged with Gizzards and/or Herring along with a Bobber way behind the boat and a freeline. When the fish are in transition I will usually employ up to 18 rods at a time, usually 10 planner boards, 6-8 downlines and a bobber to cover all the water column depths running a spread of about 80 yards. Once the fish go deep I fish for them with 10 downline rods putting the baits right in their faces. For shallow fish we throw topwater plugs and swimbaits, and when they go deep we jig spoons and flukes. ...and many other features that enable us to fish is style! I fish with light tackle supplied by Pure Fishing. We use Ambassador 6500c's for reels, Shakespeare Striper Rods, Berkley Big Game ,Vanish Fluorocarbon leader and Braid. I use Water Bugz Planner boards and use Eagle Claw Circle hooks for live bait. 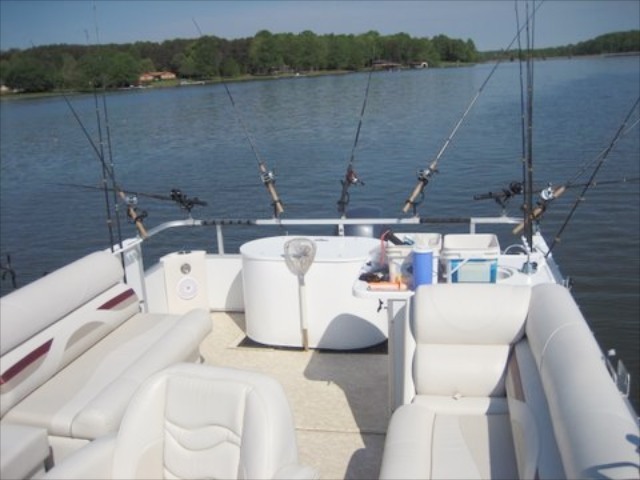 Our guide service has 4 other guides that have a total of well over 100 years of experience fishing for Stripers on Lake Anna. They fish out of a Crest Pontoon rigged exactly like mine in addition to 2 Champion Bass Boats for smaller groups or fishing in extreme wind. 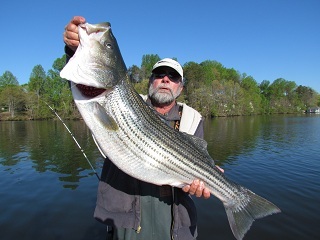 Anthony Hicks: "Striperholic" - Addicted to chasing the Stripers since the fish were introduced to him over 30 years ago. DP Seay: Second generation Lake fisherman [Father Donny Seay]. Fished the Lake all his life. Brian Mohr: Former client, completely obsessed with Stripers. Tony Smith: Always happy to turn his clients on to Stripers. Two Catfish over 30 pounds have recently been caught off his boat. There is absolutely no other guide or fisherman on the lake who can cover as much water as efficiently as I can with live bait that possesses the experience, knowledge and expertise that I have.Give us a call today! To view our catches, check out my Journal.